A Doctor Turned Mayor Solves A Murder Mystery In Colombia : Goats and Soda When Rodrigo Guerrero took office, he was shocked by the murder rate. It seemed logical to blame the drug cartels. But his epidemiologist's eye led him to a different culprit. To improve global health, you can track sneezes. Or you can track bullets. That's what Rodrigo Guerrero did after he became mayor of Cali, Colombia, in 1992, an era when the South American nation led the world in intentional homicides (93 per 100,000 people). Not only did he bring down the murder rate, but now he is being rewarded for his efforts. Monday, Guerrero became the first winner of the Roux Prize, a $100,000 award given by the Institute for Health Metrics and Evaluation at the University of Washington to someone who used evidence to have an impact on health. Guerrero had no idea that guns would become a defining issue. "I wasn't really interested in violence," says the Harvard-trained physician, now 76, who had previously worked as an epidemiologist and president of the city's university. That's not to say he was oblivious. Homicides were on his radar. But his priority as a new mayor was to improve public health. "Once we obtained and cross-checked records, we saw that homicides were the No. 1 one cause of death, well beyond chronic and contagious diseases," Guerrero says. In Cali, the nation's third-largest metropolis, the medical examiner recorded about five murders a day, and the homicide rate was five times greater than a decade ago. Taking a lesson from his Harvard training, Guerrero led an unbiased, clinical examination of the killings. He mimicked what doctors do when confronted with a disease outbreak. Violence often spreads like the flu in urban areas, and the key is to find the source. "Rodrigo gathered professionals from different arenas: physicians, statisticians, pathologists and police forces," says Oscar Rojas, an epidemiologist who worked with Guerrero in the organization later dubbed the Development, Security and Peace Program, or DESEPAZ. Drug cartels seemed the likely scapegoat, since their rise during the 1980s had paralleled a surge in violence among Colombia's largest cities. The team found that cartels had little influence on murder. But the data steered them in another direction. "We noticed that nearly two-thirds of the homicides took place on weekends," says Guerrero. Most of the incidents occurred after Friday paydays. The team didn't think drug barons were saving their dirty work for the weekend, so the researchers hunted for more clues. Comparing the coroner's records with police reports revealed that more than half of the cases involved alcohol or happened at bars. So his administration cut access to booze and set curfews: Restaurants, bars and discos couldn't serve alcohol after 1 a.m. during the week and 2 a.m. over the weekend. "As you can imagine, restaurant owners were not happy," says Guerrero. He replied: "Let's try this for three months. If nothing happens, we'll abandon the plan." Restricting firearms became part of the plan too. At the time, 90 percent of Cali's murders involved guns. That meant Guerrero had to negotiate with the biggest gun vendor in Colombia — the army. "The army manufactures and sells firearms," he explains. "They have been not very happy with the idea of restricting firearm use among the population. But we have managed to convince them with solid data that this is a very good process." With the army's OK, he implemented a ban on carrying weapons on weekends and holidays. Stop-and-frisk checkpoints, which would become so unpopular two decades later in New York City, confiscated weapons from the most dangerous parts of the city. The measures worked. Murders dropped from 2,239 in 1994 to 1,695 in 1998 — a 30 percent decline. DESEPAZ continued to influence crime policy even after Guerrero's term ended in 1994. A decade later, Cali's murder rate per 100,000 people had been cut in half. 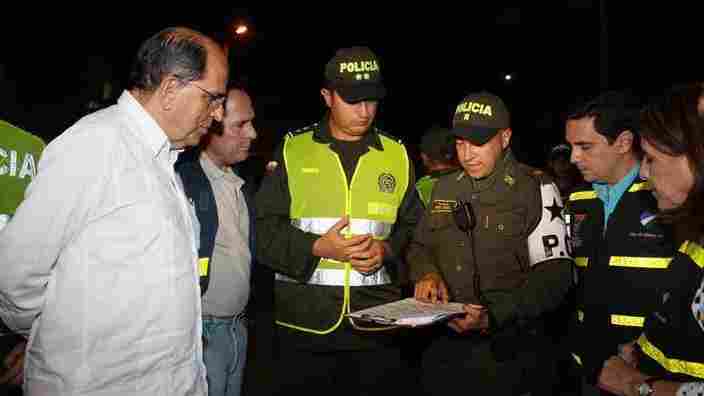 Meanwhile, other cities have copied DESEPAZ's approach; in Bogota, homicides dropped by two-thirds. "The recognition belongs to the method rather than individual," said Guerrero of the prize he received. And he's back on the case — re-elected Cali mayor in 2011 after the murders climbed again owing to beefs between drug trafficking gangs. He has since cut the murder rate from 80 per 100,000 to 56 per 100,000. "That is a substantial reduction, but still unacceptably high," he says. "When I was young, Cali was a very peaceful, small town, so the reduction of homicide is now a personal challenge for me."